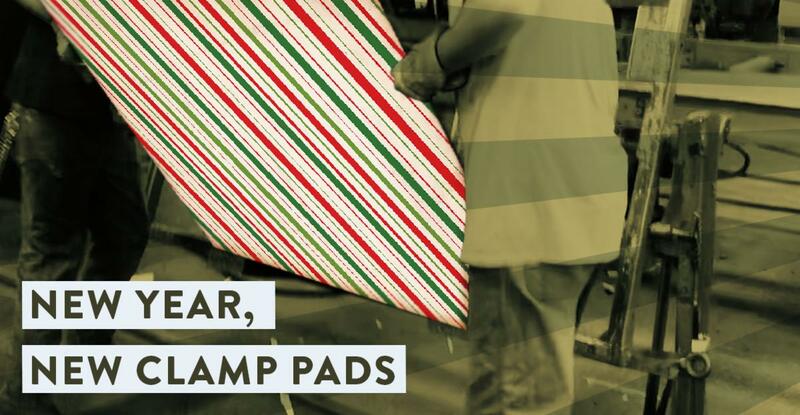 It’s a new year – resolve to recover your clamp pads instead of replacing them! Since the substrate material ALWAYS outlasts the rubber, Sioux Rubber & Urethane can recover your existing clamp pads so they look and perform like new. We can recover all types of clamp pads flat, curved and custom shapes in all sizes with rubber thickness at 1/8-inch and up. Recovered Clamp Pads Are Very Durable. If quality is a concern, rest assured your recovered clamp pads will come back with the same, if not better, durability as a new pair. We permanently apply our proprietary Endurawear™ rubber directly to the forks or in plate-form to bolt-on the forks. We vulcanize the rubber to steel, creating an unbreakable bond. Our recovered clamp pads are designed to last. It’s Cheaper To Recover To Clamp Pads. Recovering a clamp pad is considerably cheaper than replacing the entire pad. We’ve found it’s at least one-third of the cost to recover compared to replacement; these savings directly impact your bottom line. And while it may be cheaper to recover, we don’t skimp on quality. We use the highest-quality rubber compounds available to recover clamp pads, including our Endurawear™ rubber, which we stake our name on. It’s Faster To Replace Clamp Pads. Sioux Rubber & Urethane has been recovering clamp pads for more than 30 years. We know our stuff, and we know how to get it done fast. We promise quick turnaround times so you can get back to work. And since we use your original pads’ mounting holes, there’s no fiddling with getting the clamp pads back on the machine and no sending back because you ordered the wrong size. Stop wasting money and time. Make 2019 the best and most economical year ever by allowing Sioux Rubber & Urethane to recover your existing clamp pads. Download our clamp pad product sheet or contact us to get started.